How can I export my review teams' submission notes? Use Submittable's reporting tool to download an offline copy of your review teams' notes. Level 4 and 5 account administrators may find it useful to have an offline copy of the review team notes that have been used to evaluate submissions. Click on the Reports tab at the top of the page and click Create. Select the form for which you would like to download reviewer notes and give a title to your report. 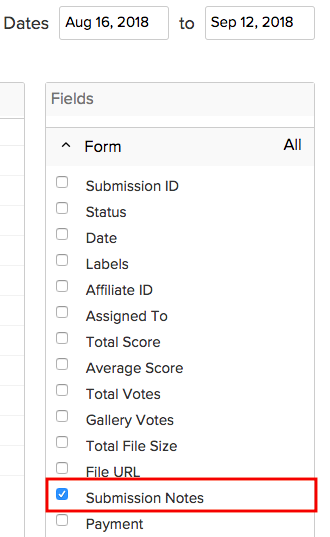 Enter a date range selection for the submissions you want to include, and then select the Submission Notes field from the form data list on the right hand side of the report dialog box. If you are using custom reviews, you can choose include review data as well. You can download your report immediately and/or save your report for future use. 3. Click Download Report to export your reviewers' notes to an offline document.